Body shops can turn dented bumpers into profits with Polyvance's new 6148 Bumper Rollers kit. Most body shops throw dented bumpers away, unaware that they can be repaired. The 6148 Bumper Rollers kit makes it easier for technicians to push dents out and restore the sharp body lines common in today's complex plastic bumper covers. 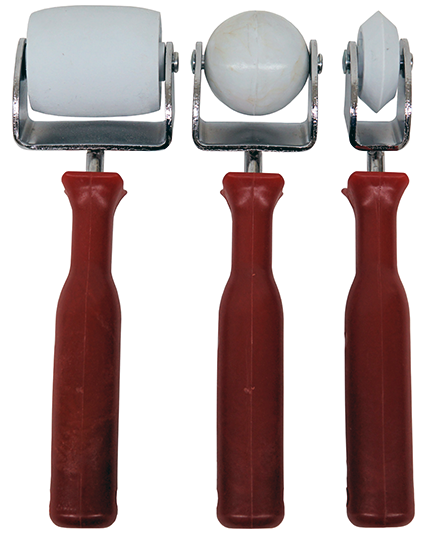 The Bumper Rollers kit consists of three heavy-duty rollers – one wide and flat, one ball-shaped for rounded corners, and one with a sharp edge for restoring body lines. To remove the dent, the technician would first heat the bumper with a heat gun to soften the plastic. Once the entire area is too hot to touch, the dent is pushed out with the Bumper Rollers. The different rollers allow the technician to reestablish body lines of various shapes and to shrink the distortions around the edges of the original dent where the plastic was stretched. The blunt end of the handle may also be used to push the dents as needed. In the end, the technician will often be able to work the dent out without the need for filler. The Bumper Rollers kit has other uses in the shop as well -- they can also be used to remove dents from sheet metal and to press down adhesive sound-deadening pads on floor panels. The Bumper Rollers kit was recognized for its innovation at SEMA where it received a Global Media Award. The 6148 Bumper Rollers kit has a suggested User price of $99.95 and is now available from paint & body jobber stores. Use your smartphone`s scanner to share this page with a friend.